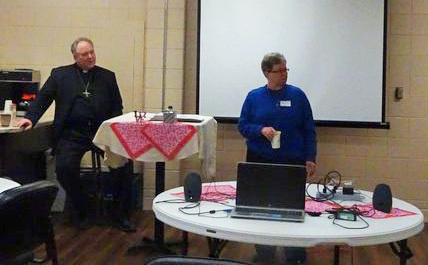 Pastor Gregory Hoffmann and Parish Nurse Coordinator Marcia Schnorr take questions at a recent NID Parish Nurse Network gathering. For a listing of all scheduled gatherings, please contact marcyschnorr2009@gmail.com or check their Facebook page (LCMS-Northern Illinois District Parish Nurse Network). LCMS Health Ministry also provides a video lecture most months that are specifically planned for parish nurses. Visit lcms.org/health/parishnursing to view.